Demonstrators carry placards as they march to protest against corruption in Cape Town, South Africa, Sept. 30, 2015. Thousands of South Africans from trade unions, opposition parties and civil society groups marched against corruption on Wednesday, calling on President Jacob Zuma to clean up government before local elections next year. Civil society groups organized protests in the capital Pretoria and in Cape Town. More marches are due next month. Opposition political parties latched onto the opportunity to mobilize crowds to criticize Zuma's African National Congress (ANC) with some local votes expected to be tight next year, including in Gauteng, home to the economic hub of Johannesburg. "Corruption is killing our country," said Levy Mabokachaba, 41, a member of the left-wing Economic Freedom Fighters (EFF), as rowdy crowds waved placards and sang anti-government songs. "This president just does what he wants and we won't stand for it any longer," Mabokachaba said. "The people are demanding change. It all starts from the president." The ANC released a statement that said it welcomed the marches and hoped the organizations involved would support its efforts to "subdue the scourge of corruption." The Democratic Alliance, the main opposition party, said on Tuesday it wants police to investigate the ANC after Tokyo-based Hitachi paid to settle a U.S. investigation into improper payments made to the South African government. The Hitachi case is the latest corruption scandal to taint the ANC, which is still reeling from accusations it paid a $10 million bribe to win the right to host the 2010 World Cup. The ANC denies those charges. FILE - South African President Jacob Zuma speaks at the opening plenary session of the World Economic Forum (WEF) on Africa in Cape Town, June 4, 2015. Zuma was asked to step down by his opponents after the public prosecutor said last March the president had benefited unduly from an "excessive" $23 million state-funded security upgrade to his country home. 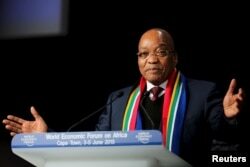 Zuma denies wrongdoing. The leaders at the march in Pretoria included EFF head Julius Malema and former trade union boss Zwelinzima Vavi, both fervent Zuma critics. That prompted some to question whether the campaign had been politically hijacked. "There are a lot of political parties involved and they have their agenda, but we also have a lot of other organizations and individuals here," said Babalwa Freemantle, 26, one of the organizers at Unite Against Corruption, an NGO. "Corruption impacts everybody." Fewer people attended the march than promised after workers were warned not to take the day off. Nationwide anti-corruption marches are due on Oct. 14, when workers will be protected if they decide to march. If the campaign picks up momentum, Zuma risks losing more support from the tens of millions of working-class black South Africans who have supported the ANC since the end of apartheid 21 years ago. "People don't have houses or water. They are homeless and hungry because there is a lot of corruption," said Brick Mololo, 57, gripping a "No to Exploitation" placard. "Zuma must step down," he said.